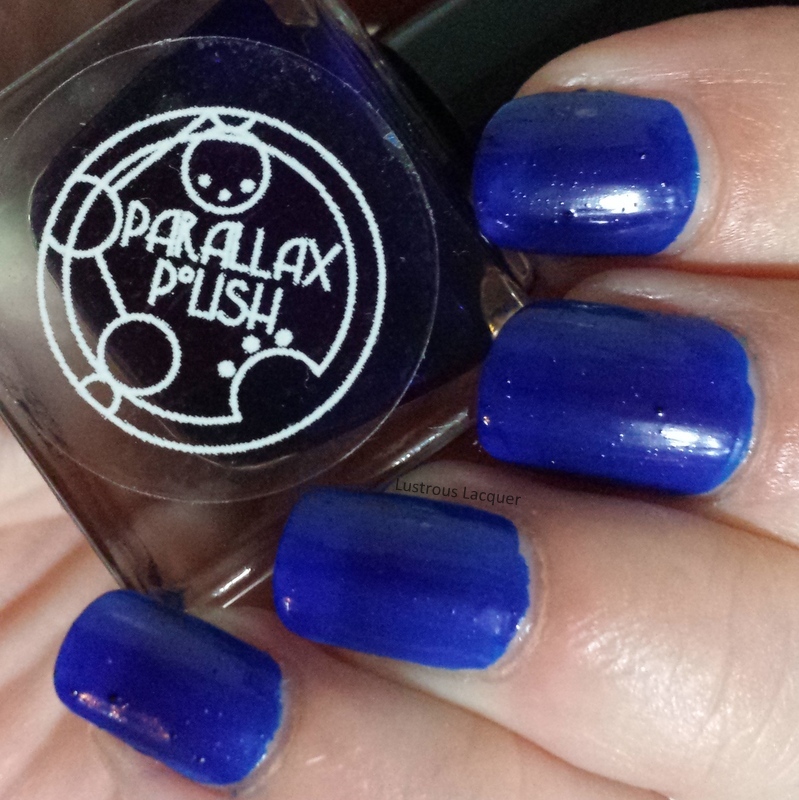 Rounding out this fun week of the new Brain Scan Collection from Parallax Polish is the matte finishes. 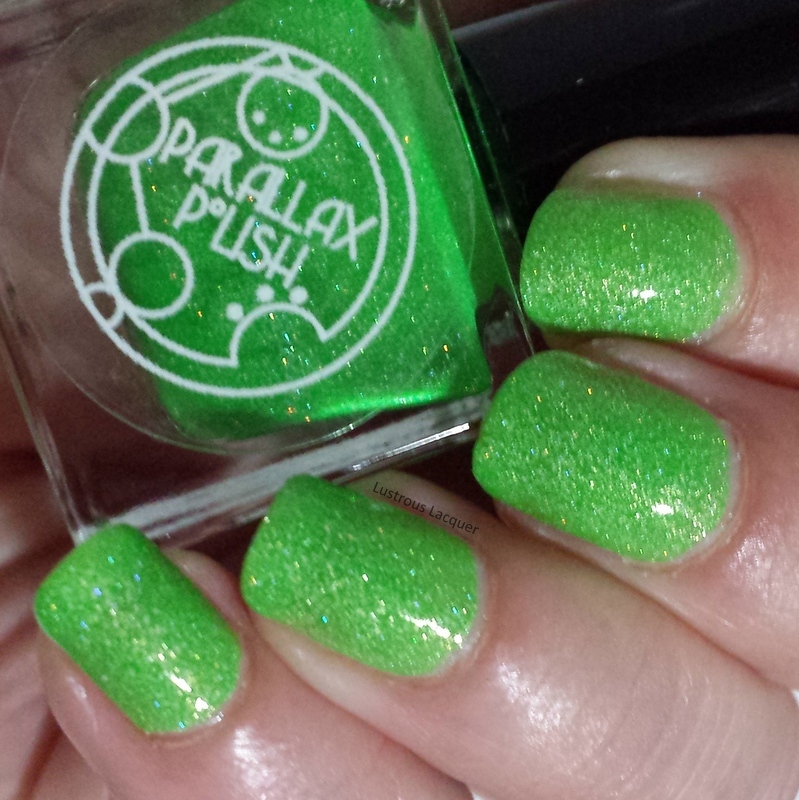 I do have to warn you I am sharing 2 polishes today but only 1 will be available in this finish. I will get more into that once I show you the polish later in the post. If you're just joining my reviews of this collection be sure to check out my previous posts on the linear holos and the scattered holos. And remember each color is available in all 3 finishes for a total of 21 options to choose from when the collection releases this Saturday, Aug 29th. Fusiform Gyrus is as eye-searing neon orange. My camera had a lot of trouble with this one. I used a white base on my ring finger only to see if that made much of a difference. It's not as obvious in this photo but the orange color really popped over white. Shown here is 2 coats without top coat. 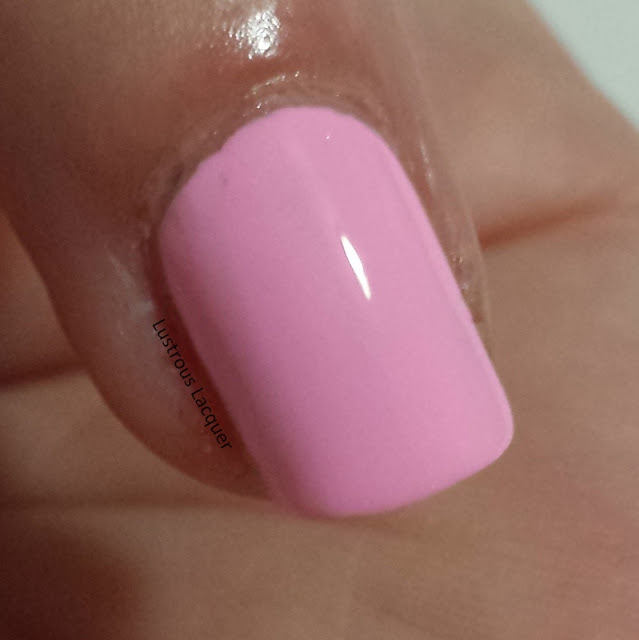 The application was very good for a matte polish not to mention a neon matte polish. There were a few streaks on the first coat but they were minimal. And dry time was almost nonexistent. In the macro shot, you can really see how much the white undies helps the orange to pop. And you'll see later how great this goes with black. I'm already getting ideas for a Halloween manicure. 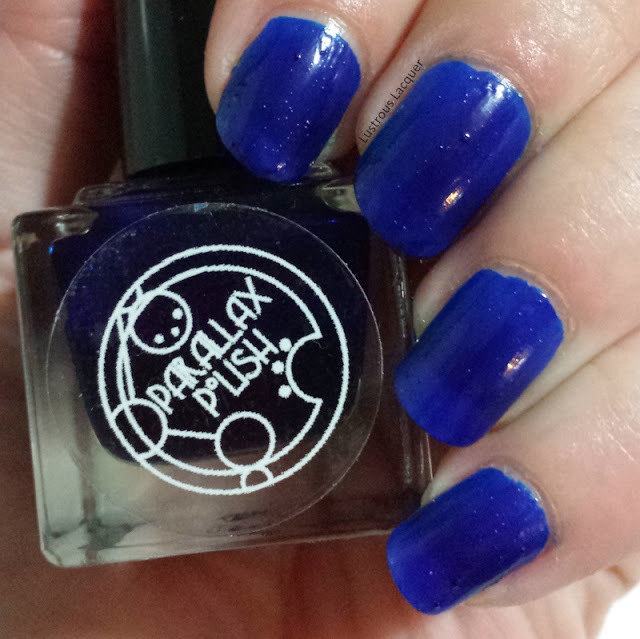 Brocas is an indigo blue polish shown here in the matte finish. This polish will not be available in the matte finish for sale on Saturday. As you can see there are small deposits of pigment on my nails. After talking with Erin about this and a few tweaks to the formula the matte finish has been pulled for now. I decided to still share this polish so you could see the color, and decide if you'd want it in another finish. I love this blue but it's just the crankiest thing. The matte version of #broca does not break down all the way, and you get pigment clumps, which can be seen here. Lame. I hadn't noticed this fact because (I think) my tester had settled from sitting for a while, and I'm easily distracted by sparkly things (aka the sparkle versions of this color). 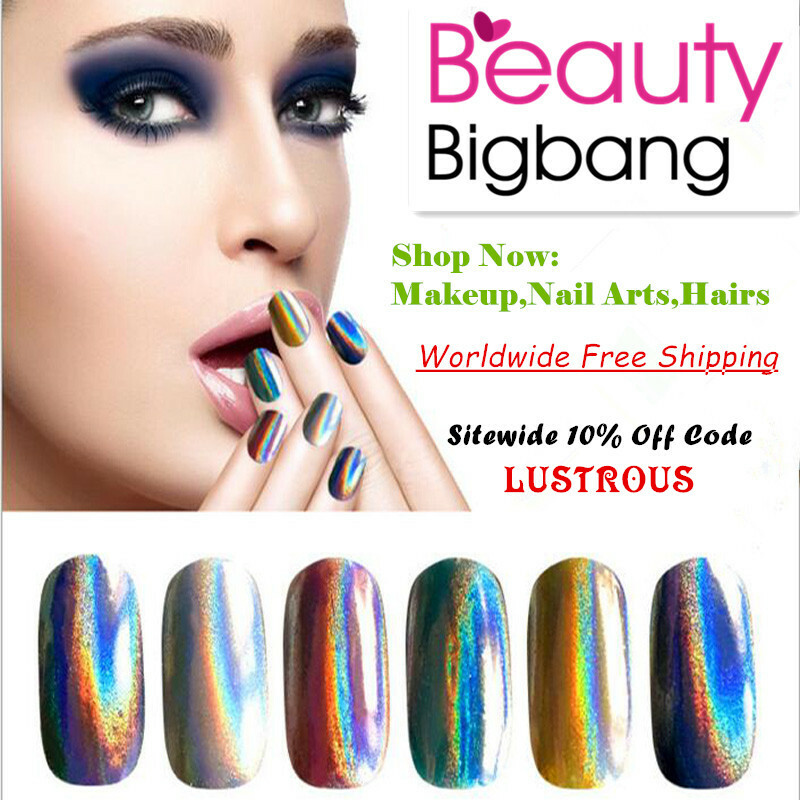 The lovely ladies of @lustrouslacquer and @mynailpolishobsession did notice thankfully so I am announcing that the matte version won't be available on the launch. I'm working on a solution but not optimistic for this exact color. The holo versions appear to be fine, as they are made in a different way. They will be available for the launch! 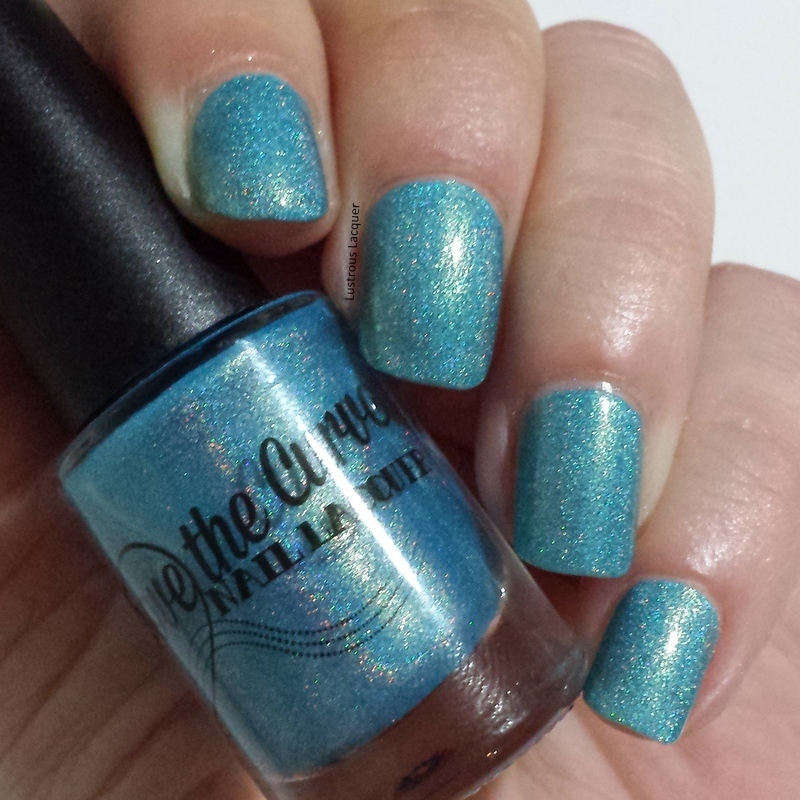 Once I have a stable version of this color, I'll send it out for swatches from folks. If you want to buy the whole set matte, you can get the upgraded holo version of Brocas for free. 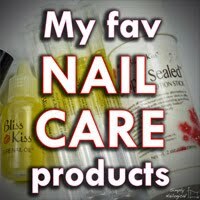 ($6x6 polishes = 36$ plus Brocas of your choice). Thanks for your understanding! 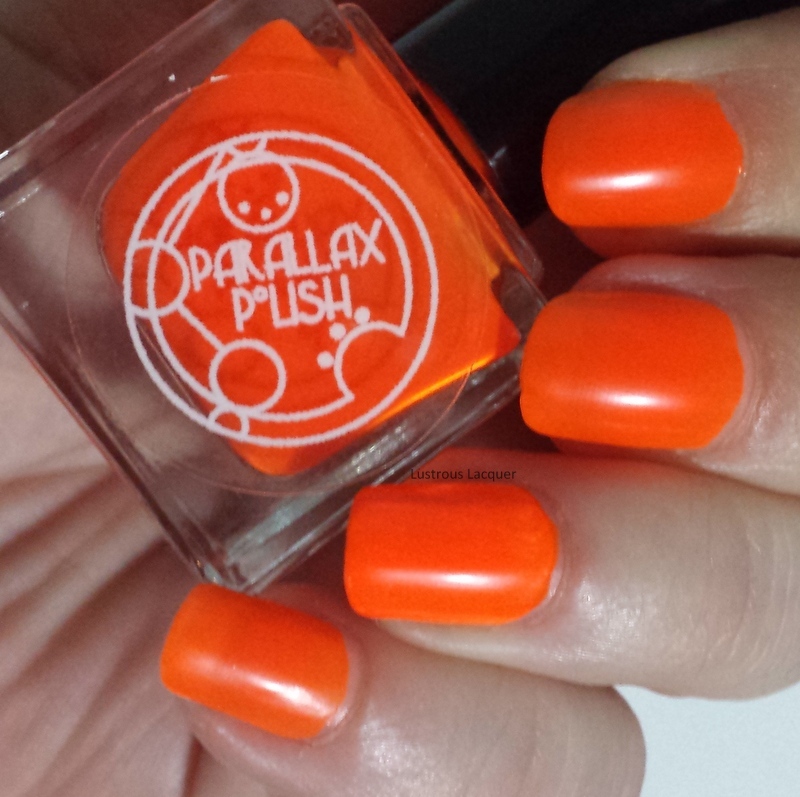 I didn't want to list a polish that had issues, but also be transparent about why it wasn't available yet. Despite the pesky formula issues application was really good. The polish flowed smoothly and dried quickly. I like how squishy it looks here with 2 coats. And I happened to notice how close this polish is to Bryant from the SeCience Collection if you're looking for a close dupe. Brocas is a little darker. Now, how about some nail art? You didn't think Id finish off this review without any, did you? For Fusiform Gyrus I used Finger Paints Black Expressionism and Image plate 03 From MoYou Londons tropical collection. The little black rhinestone is from Born Pretty Store. The accent nail on Brocas was done with Milani White on the Spot and Image plate 04 from MoYou Londons Kaleidoscope collection. I then went in and added a few dots with Brocas for my own little twist on the design. 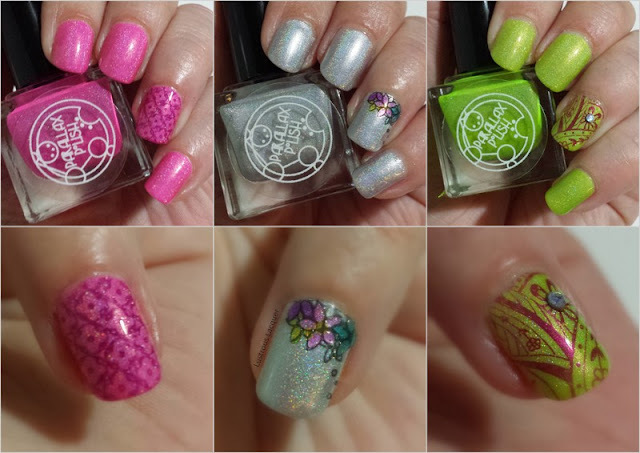 If you'd like to see other colors available for purchase check out my previous reviews of The Women in Science Collection, Krypton, Marshall, Big Bang, and The SeCience Collection. Thanks for stopping by and Happy Polishing! Hey, everyone, I'm back with a few more polishes to show you from the Brain Scan collection releasing this Saturday from Parallax Polish. I hope you enjoyed the Linear Holos I shared on Monday, now sit back and get ready for the Scattered holos. In case you missed my previous post this collection consists of 7 colors available in 3 different finishes for a total of 21 options to choose from. Fair warning though the finish does have some effect on the final color. You can see what I mean in the image below. Thankfully Erin is amazing at having blogger swatches with every listed which should help when it comes time to order. Speaking of swatches, let's get to mine! Corpus Callosum is an electric green shown here in the scattered holo version. Just look at that vibrant green, this baby almost glows in the sun. Sadly there wasn't much sun available to take my photos in. The application was like butter with the polish going on smooth and even. Seriously I wish all polishes applied like this collection. I haven't had to do an ounce of clean up and for me, that's saying something. Shown here is 2 coats plus top coat. 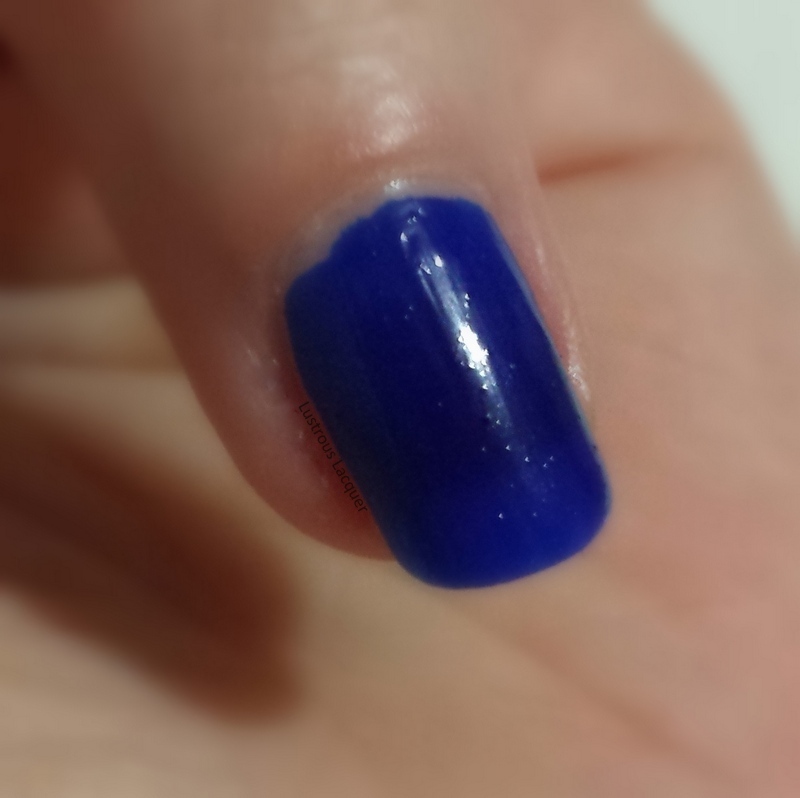 There is the teeny tiniest VNL after 2 coats but not enough to bother me. In fact, I could only see it when I was outside. Seriously, how fun is this green! Its super sparkly in person, not so much in incandescently lit photos. Dang grey days not allowing me to take sun shots. Ugh, blogger problems, the struggle is real right. Hippo Campus is a Byzantine polish shown here in the scattered holo version. Byzantine is a rich tone of medium purple toned toward magenta. Which I just learned tonight thanks to a handy dandy color listing on Wikipedia. Ok so I thought I was impressed with the application of Corpus Callosum but after putting Hippos Campus on I was impressed x10! This beauty is a smooth, even goes on like butter as close to a one coater as you can get. I did do 2 coats for good measure and because well I always do 2 coats, plus top coat. This is my kind of color, and I love how much it sparkles. I think it would be interesting to combine the two polishes I've shown you today in a manicure. The colors would play so nicely off each other. What do you think should I try it? 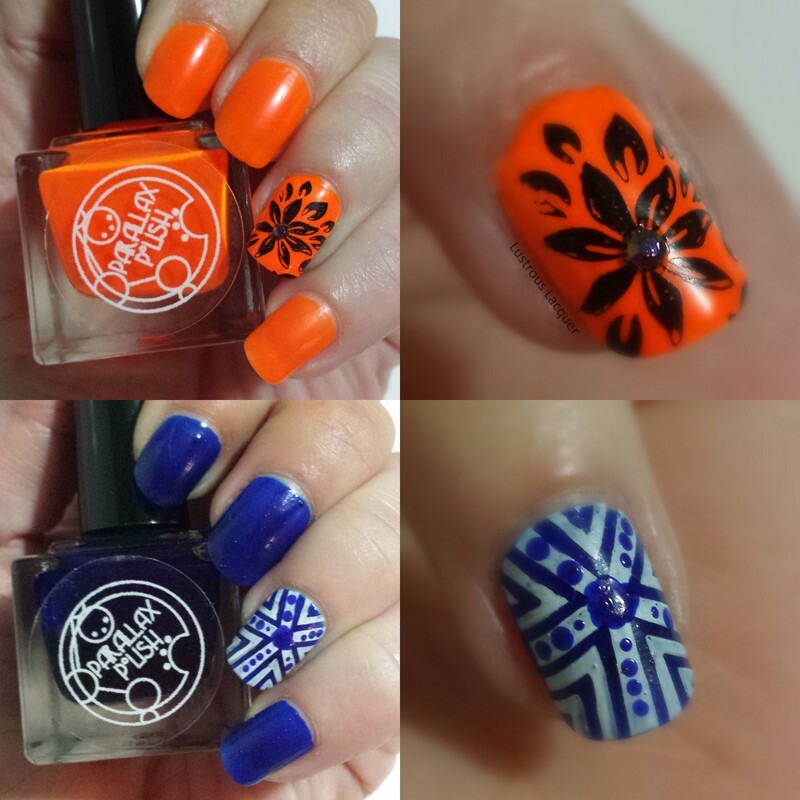 Of course, just like my last post, I did do a little nail art with these colors. For Corpus Callosum I made my own decal using Bundle Monster plate BM12 and filled in the flowers with Parallax Polish April Holo and Orly Ablaze, Tropical Pop and Hot Tropics. 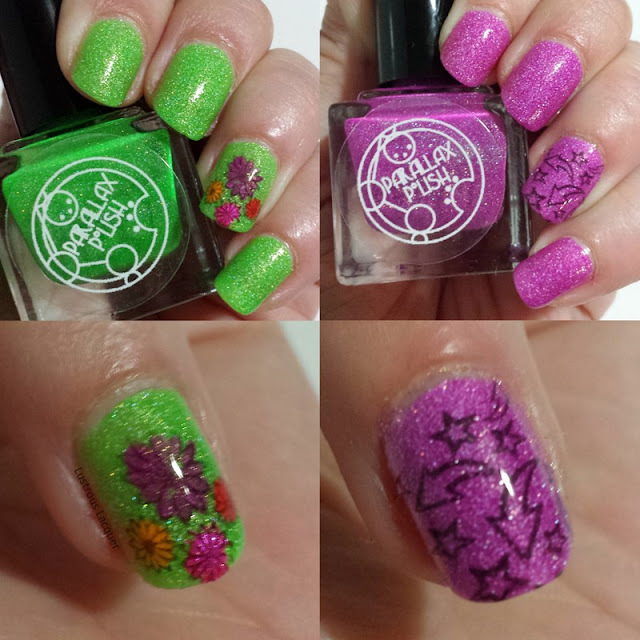 Sadly my decal stretched a bit when taking it off the stamper head so I have a long goofy flower but every mani can't be a winner I guess. For Hippo Campus, I kept it simple with an image from Bundle Monster plate BM20 and Zoya Black Swan. I used my jumbo squishy stamper for the first time and realized that I've been using the wrong stamper for the last few years. Boy did it make a difference, and I have retired my stiff stamper to decals only. Unless it keeps giving me issues with the decal removal that is. This week on the blog I will be sharing with you the upcoming Brain Scan Collection from Parallax Polish. This 7 color collection will be available for purchase in 3 finishes ( matte, scattered holo and soft linear holo) for a total of 21 polishes. 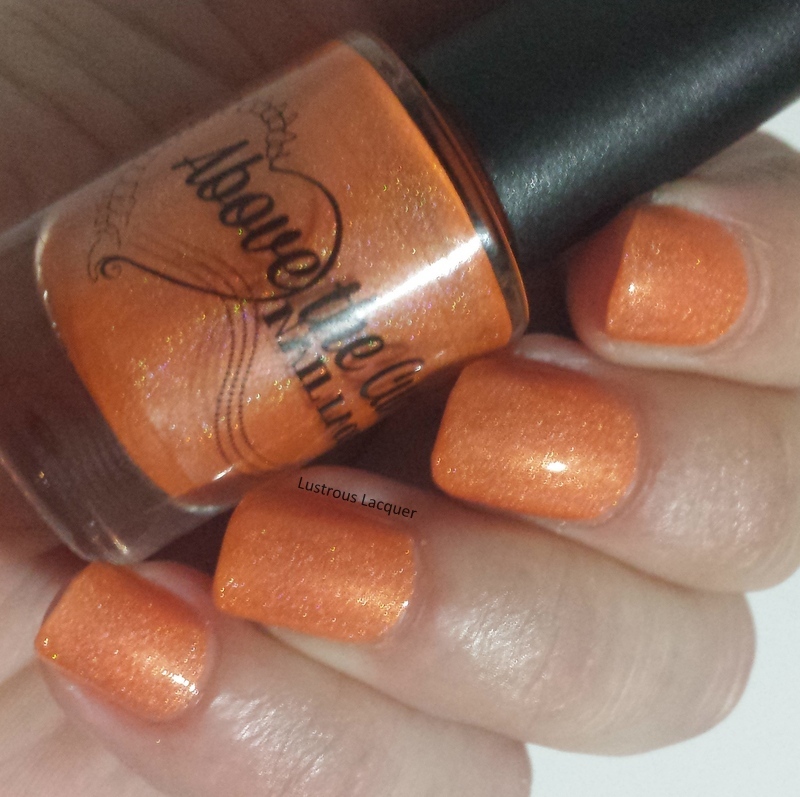 Yes, you read that right 21 polishes! No I won't be showing you all 21, I'm not sure my fingers could handle that much acetone, but I do have a nice variety of the 7 colors. I've decided to break this review up into 3 posts with each post focusing on the 3 finishes available. 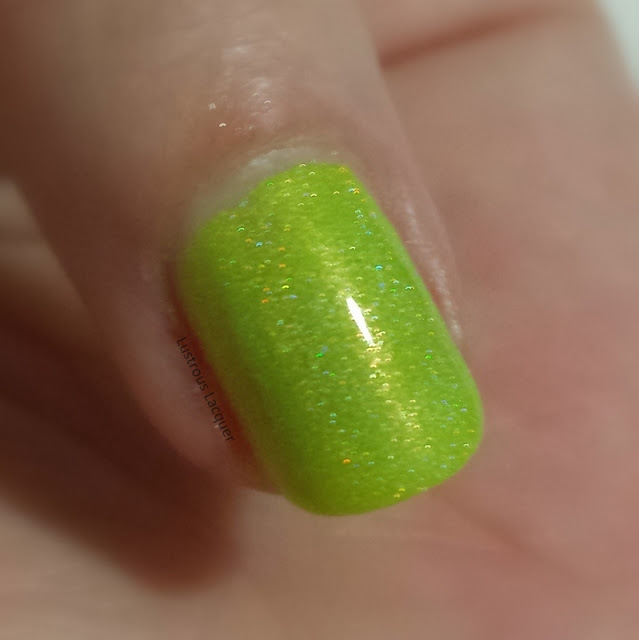 First up is the Soft linear holos, and a little behinds the scenes info about this collection. Now you'll notice in the above graphic that the finish does affect the color some as well as the price, so make note of that when it comes time to order. Nystagmus is a white polish that leans silver in the soft linear holo version. I thought of it as an icy silver when I first put it on. The application was smooth and even with surprising opaqueness on the first coat. Shown here is 2 coats plus top coat. 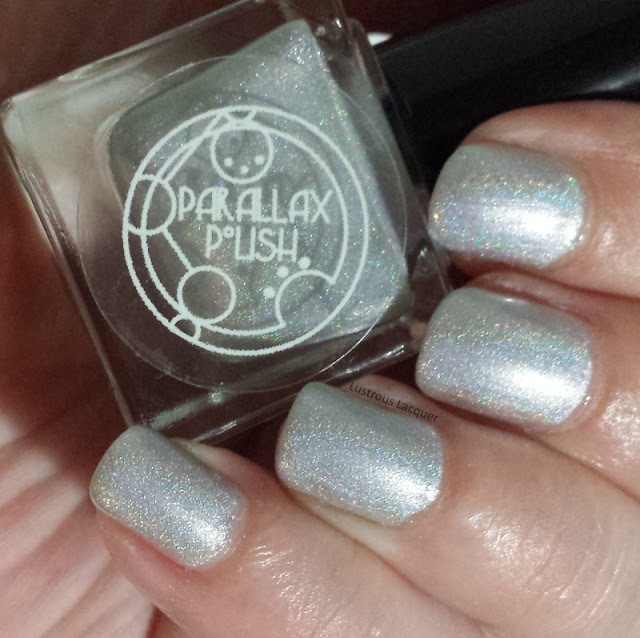 The linear holo is subtle but you will get that coveted flash in certain lighting. Out of the 3 polishes, I'm showing you today Nystagmus had the strongest flash for me. I absolutely love this color and will be breaking it out at Christmas time for some festive manicures. 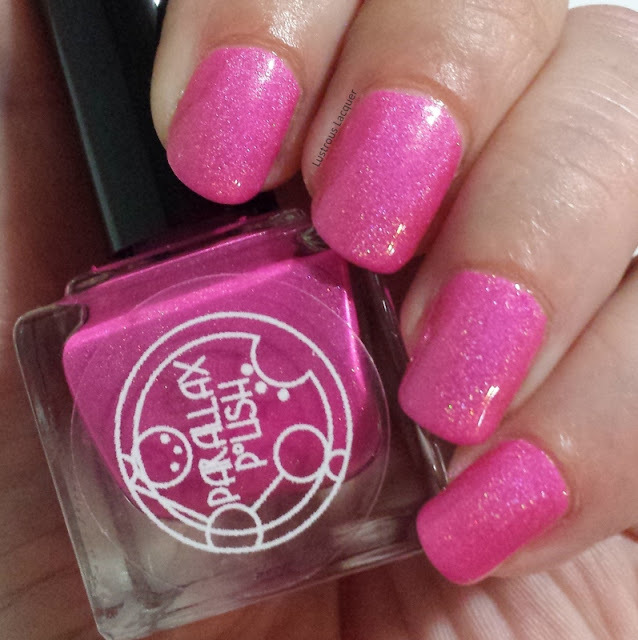 Amygdala is a bright medium pink with soft linear holo. It appears that the color is pretty consistent throughout the 3 finishes but since I don't have all 3 to compare Id recommend looking up swatches before ordering. The application was again smooth and even. While not quite as opaque on the first coat and Nystagmus it builds up nicely. Shown here is 2 coats plus top coat. The macro shot shows that while not very strong you still get a slight flash with Amygdlala. I might be a bit bias being a pink nail polish lover but I think this is a gorgeous color even without a strong flash. 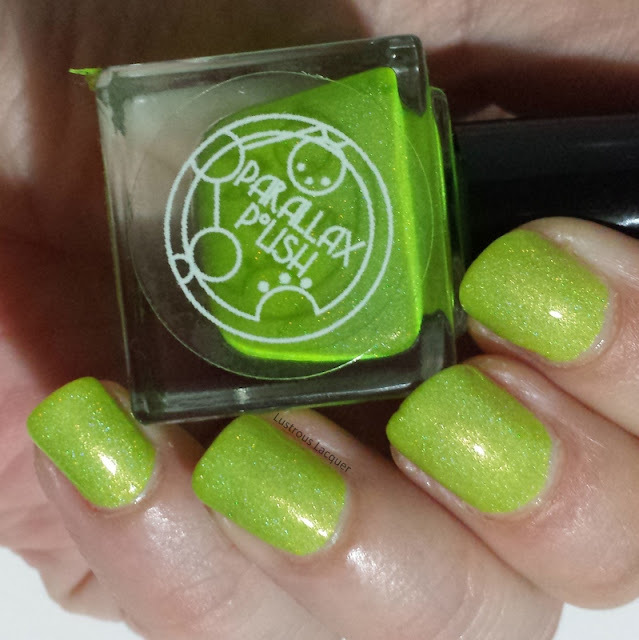 On-Off Cells is a highlighter yellow polish that leans green in the soft holo version. While it will look green in all of my photos there where moments when applying it that I was reminded of a yellow highlighter. Again I was surprised by how opaque this was on the first coat. The application was smooth and even. I did experience some slight streaking when I used a thin coat on my pinky, but regular application would give you no trouble. Shown here is 2 coats plus top coat. 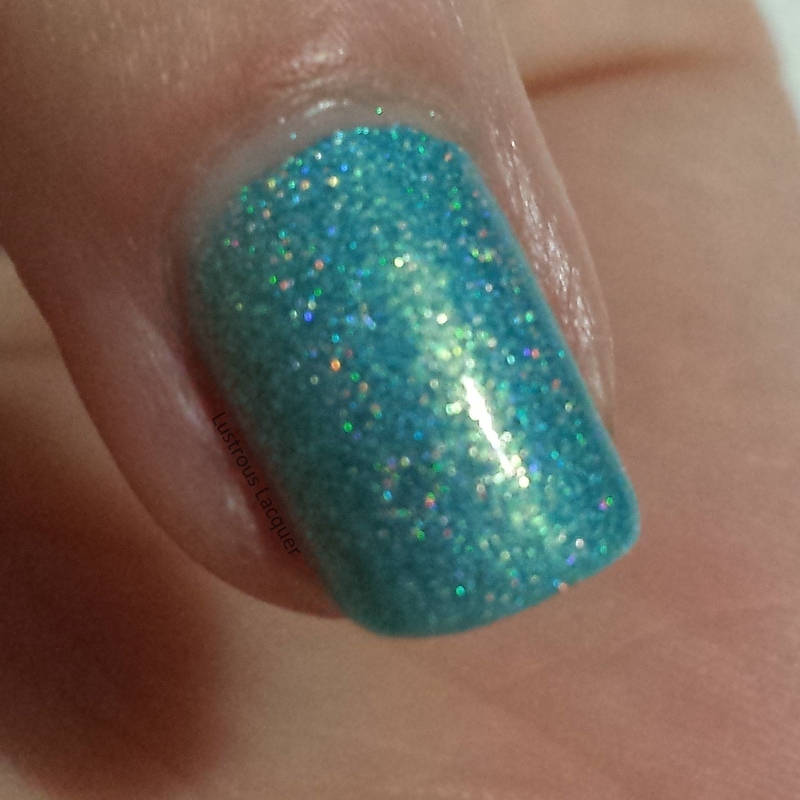 Out of the 3 polishes, this one had the least amount of holographic flash. I was able to see it at times but could not capture it on film. I wasn't so sure I would like this color at first to be completely honest but I do. 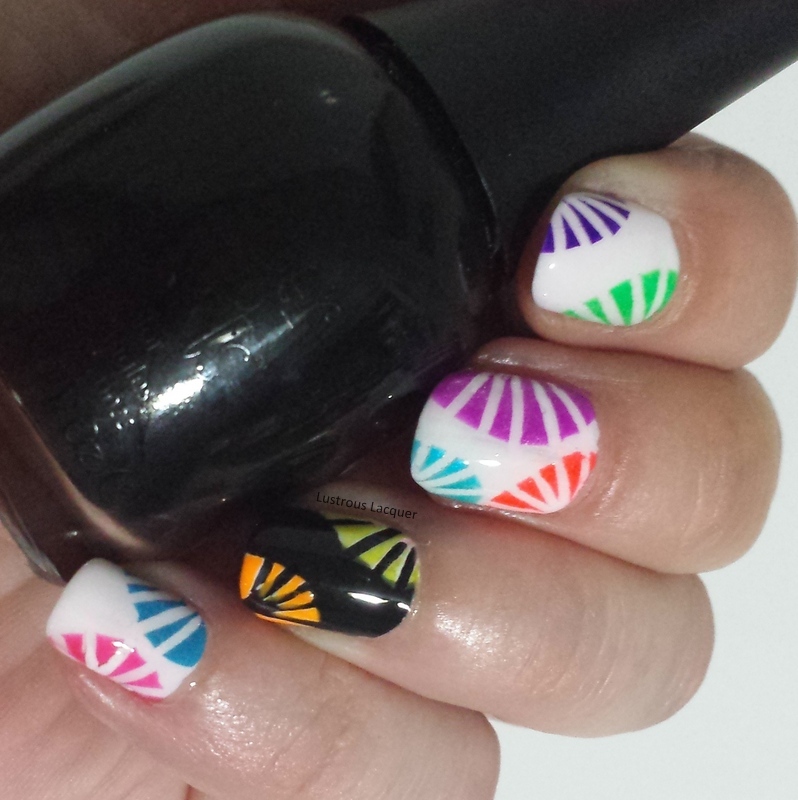 Its fun, bright, and looks good with nail art. Speaking of nail art, I've got some to show you. Some of you may have seen a few sneak peeks floating around Instagram already but here are the details. To dress up Amygdlala I used OPI DS Extravagance and Konad plate M70. The accent nail on Nystagmus was done with Konad plate M51 and the OPI sheer tints. And finally, I added China Glaze Don't Make me Wine and Konad plate M60 to On-Off Cells with a rhinestone just because. At the time I'm writing this there is no official release date for this collection but a little birdie told me an announcement would be made sometime on Monday, Aug 24th so I will keep you posted. IN the meantime I'd love to hear which one is your favorite of these 3. Make sure you stop back Wednesday where I will be showing you the scattered holo colors and don't forget to check out Parallax Polish for updates. I've just been informed that this collection will be available for purchase on Saturday, August 29th. 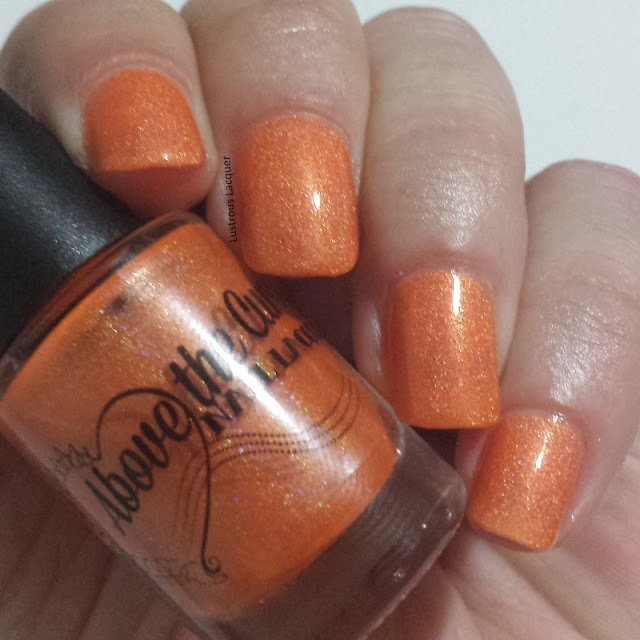 Every month the members of Hobby Polish Bloggers or HPB for short pick a theme and do a link up. This months theme is Neons and we were allowed complete creativity for these manicures. As soon as I heard the theme I knew I wanted to do a take on the nail art I did over Fickle Fairy Potions Hopelessly Devoted. Unfortunately the longer I had to think about the idea the less confident I became. So I took to my Facebook page to ask for opinions. 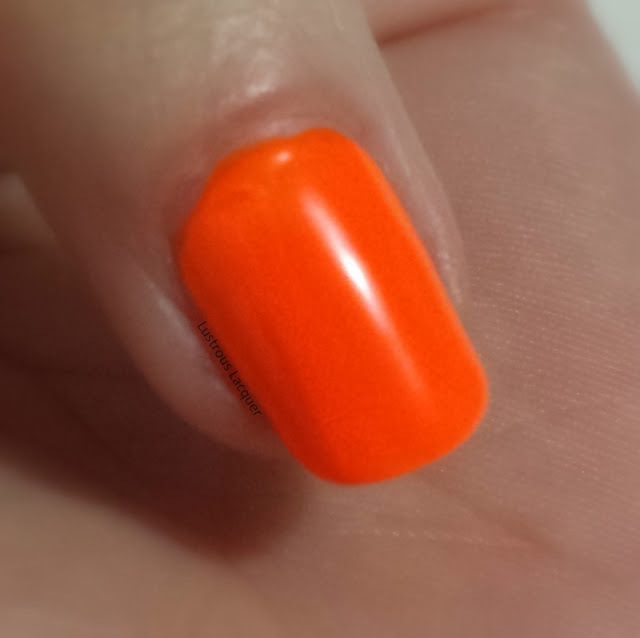 I originally wanted a black base for this manicure but I knew that the neon would pop better over white. After putting it to a vote on Facebook, a white base had won and I went with it. But I still wanted to know how it would look over black and had to include it on one nail. This is what I came up with. 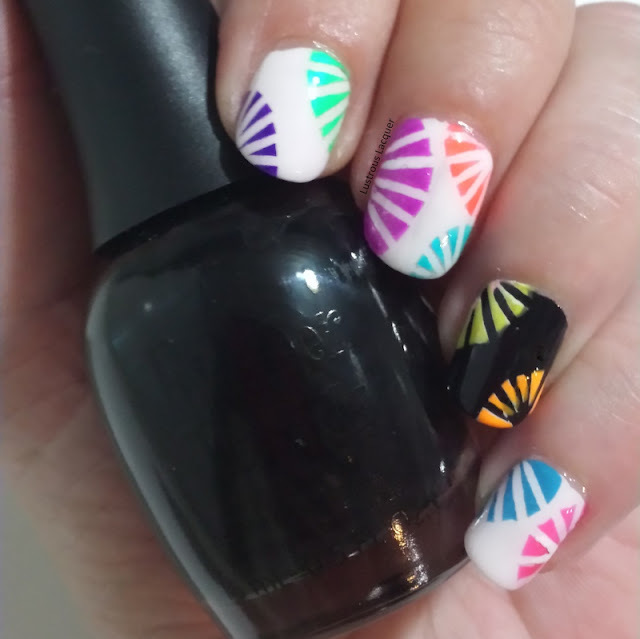 I used 11 polishes and some striping tape to create this manicure. It took almost 4 hours to do because of all the dry time needed. Looking at it now I wish I would have gone with my original idea and just used a black base but the white isn't bad. 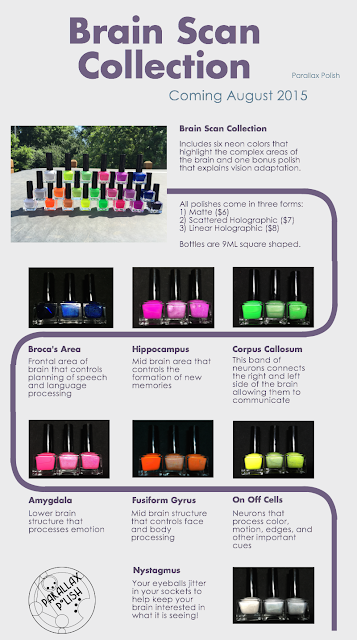 Ready for the list of polishes used? Finger Paints Black Expressionism and Paper Mache. Besides being tedious the tricky part for me was putting a layer of white down under the neon parts of the accent nail. But that also happens to be my favorite part of the manicure. What do you think? Should I have stuck with my original idea and gone with a completely black base or do you like the white? Don't forget to check out what the other members of the group have come up with. Thanks for stopping by and Happy Polishing! It's Wednesday and that means we are on our way towards the weekend. Things here are just as hectic as ever as we wrap up summer and get ready for school, I also have been working on getting a new job so there might be all sorts of changes in this house in the next month. Because of all this, I've decided to keep today's post short and sweet. Besides after my long post on Monday I figured your eyes might need a break. 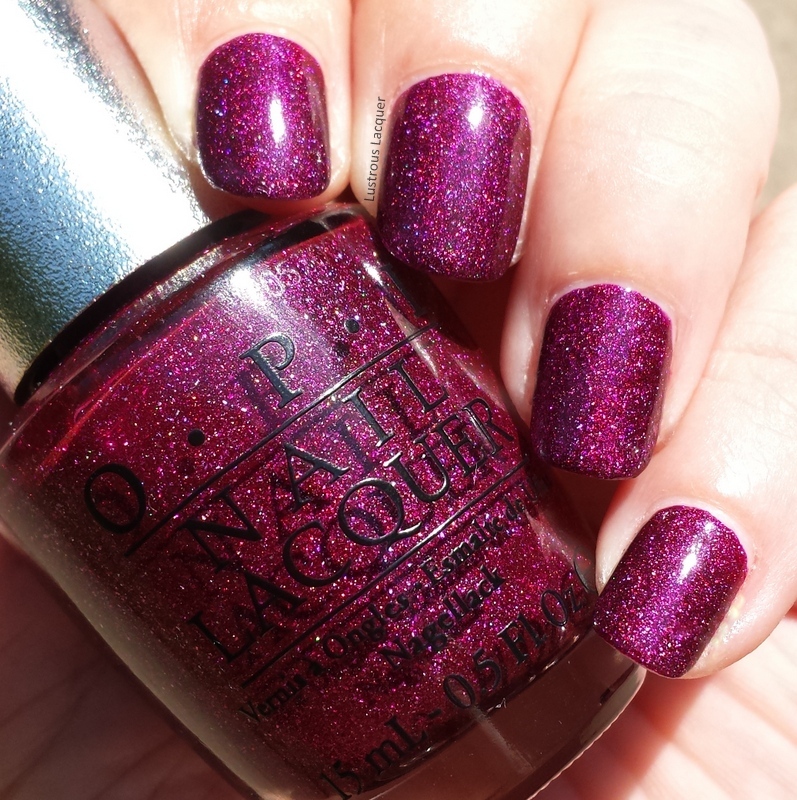 Today's I'm sharing OPI's DS Extravagance with you. A polish that I've had in my collection for quite some time but never seem to get tired of wearing. A little disclaimer: I know some of these photos might look enhanced but the only editing I did was to crop and watermark. 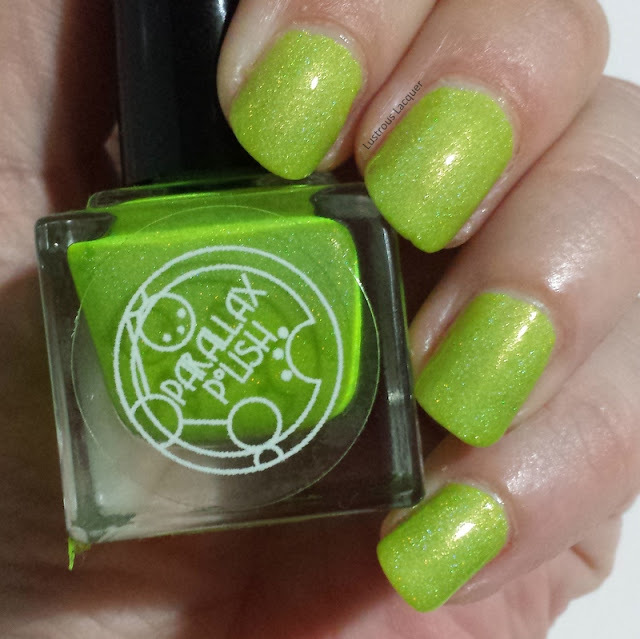 Each photo was taken in direct sunlight which made the polish almost glow on my nails. 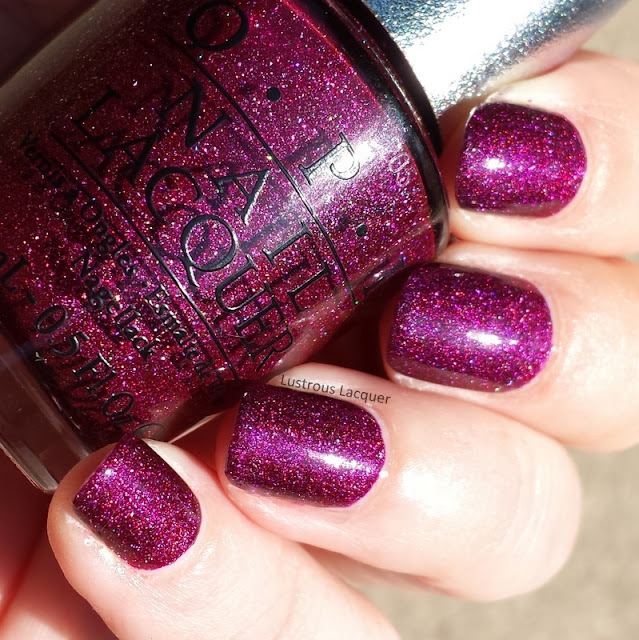 DS Extravagance is a deep rich magenta with scattered holo. The application was near perfection with the first coat being extremely opaque. Shown here is 2 coats plus top coat. I actually own quite a few OPI polishes but I find myself not reaching for them very often. I don't know why exactly. It might be because they are in the back of a helmer drawer and I forget what colors I have? Because DS Extravagance was so opaque on the first coat I'm wondering if it will stamp nicely. I have a feeling it will, but that's a manicure for another post. I'm also wondering if this might be a dupe for Orly Miss Conduct so there's another post idea! And if you'd like to see some nail art I did using DS Extravagance make sure to follow me on Instagram. I hope you enjoyed this quick post, I'm off to finish up that never-ending school supply list. Thanks for stopping by and Happy Polishing! Happy Monday! For those of you still following me, I want to say thank you. I know my blogging has been a bit sporadic lately and that can get annoying for readers. I've just been in a bit of a blogging rut lately. My nails have been giving me issues with peeling and breaking. I've had to go to nubbins and am usually uninspired when that happens. And when inspiration runs out I run out of things to post which as we all know can be hard. To help get rid of my blogging blues I broke out the bright and fun School's Out for Summer Collection from Above the Curve. I've already shown you some rainbow nail art I did with this collection but now it's time for swatches and to showcase each polish individually. This collection is actually the one polish purchase I have made all year. The minute I saw them I knew I had to have them and only spending $26 (for minis) all year is pretty darn good if you ask me. I have a lot of pictures to show you but the formula was consistent throughout the collection so I'll just get that out of the way first. All 5 polishes in this collection apply like a dream, a little sheer on the first coat but build up nicely. Each photo is shown with 2 coats plus top coat. While completely packed with sparkle they lean a little more to the scattered holo side but you do get that coveted linear flash from all 5, with Stop That (Ice Cream) Truck! having the strongest flash. These muted holographic neons require no undies to get a great pop of color. There's not a single stain-er in the bunch and they are fast drying. They do tend to dry a little on the matte side but top coat not only brings out the sparkle but also seems to intensify the color. Now that the particulars are out of the way, let's get to the pretty photos. And just a heads up my OCD requires me to show them to you in rainbow order. 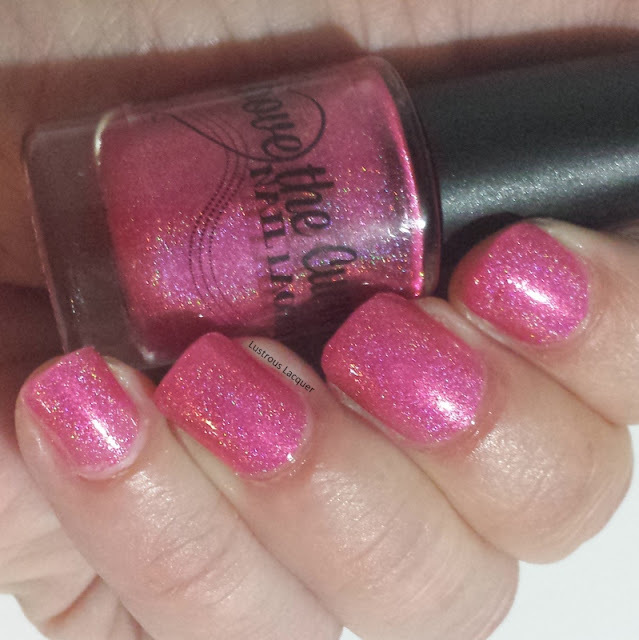 Pool Parties & Barbecues is described as a pink linear holographic shimmer. Scary Stories by the Fire is described as an orange linear holographic shimmer. Are We There Yet? 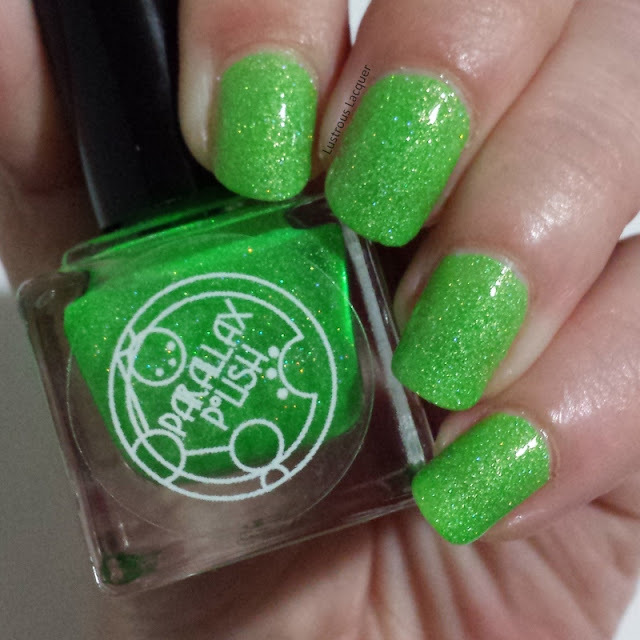 is described as a bright green linear holographic shimmer. This is the only one I was worried about needing 3 coats with but it builds up nicely and I only needed 2. 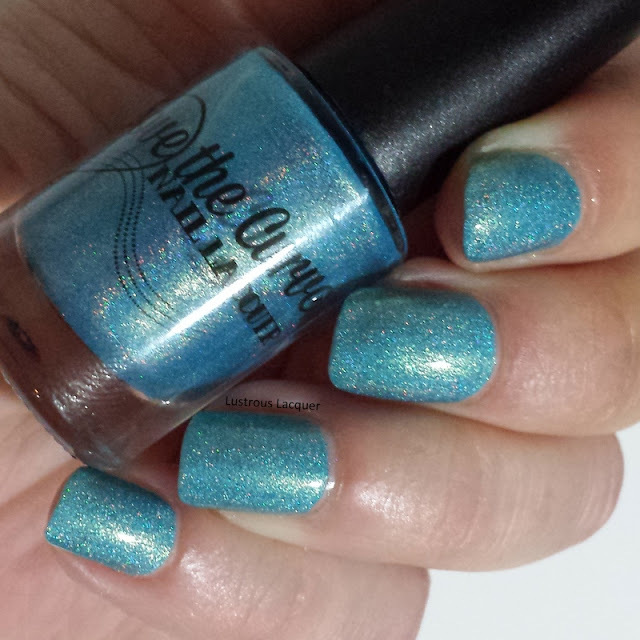 Summer Camp Blues is described as a light blue linear holographic shimmer. Stop That ( Ice Cream) Truck! is described as a purple linear holographic shimmer. At the time of writing this Above the Curve's shop is closed and I am not sure if the collection is still available. I'll keep checking and update this post once the shop opens again. I'd say this was a good investment for breaking my no buy over, what do you think? Do you have any favorites from this collection? Thanks for stopping by and Happy Polishing! Happy Wednesday folks! Sorry about missing my posts on Monday but life got away from me a bit. With all this back to school stuff going on time just seems to disappear. 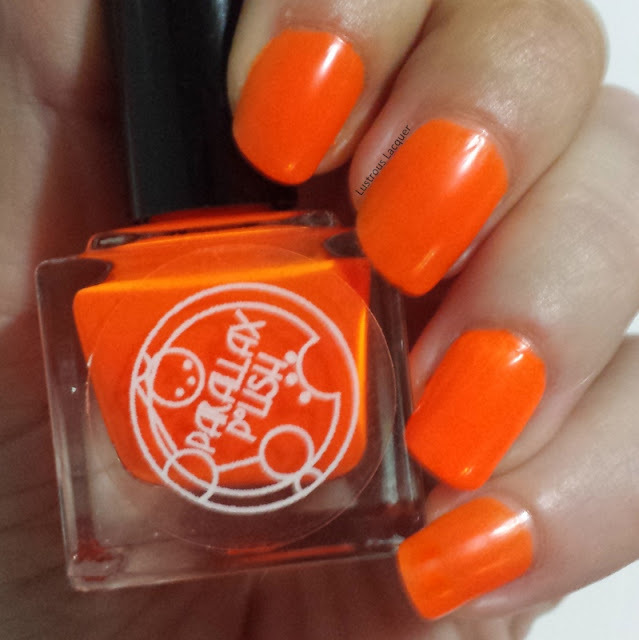 Not to fear I've got a fun bright polish to show you today and hopefully make up for my short absence. 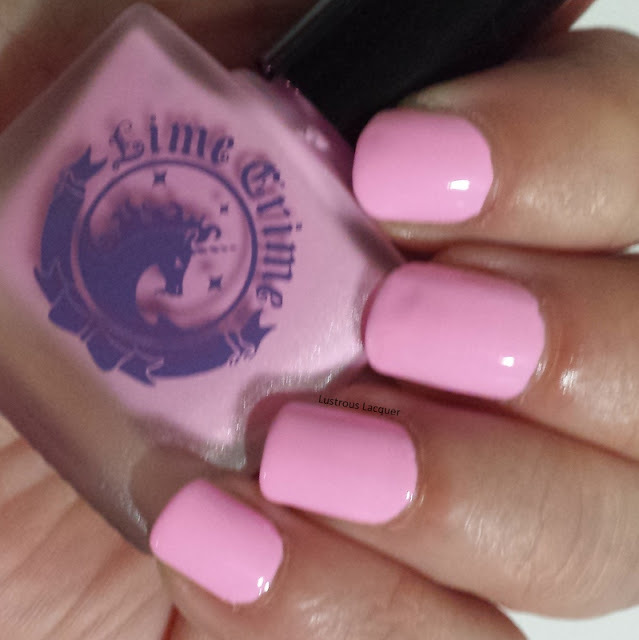 Lime Crime Parfait Day is a Saturated baby pink or some might call it a muted neon pink. Either way, it's a fun color to wear during the summer months. An added bonus is that this color makes your skin look really tan! Like a lot of pastel polishes the first coat of Parfait Day goes on a little streaky but evens out on the second. As you can see from my photos it's a little unforgiving with nail imperfections so a good ridge filling base coat is a good idea. Parfait day is one of the few colors in my collection that I have worn numerous times. In fact, it's on my toes as we speak. I just love this color during the summer and have been known to whip it out during those long winter days when I need a pick me up. Plus it looks great with nail art. I used Parfait Day in the stamped gradient I did for a friends wedding last summer. 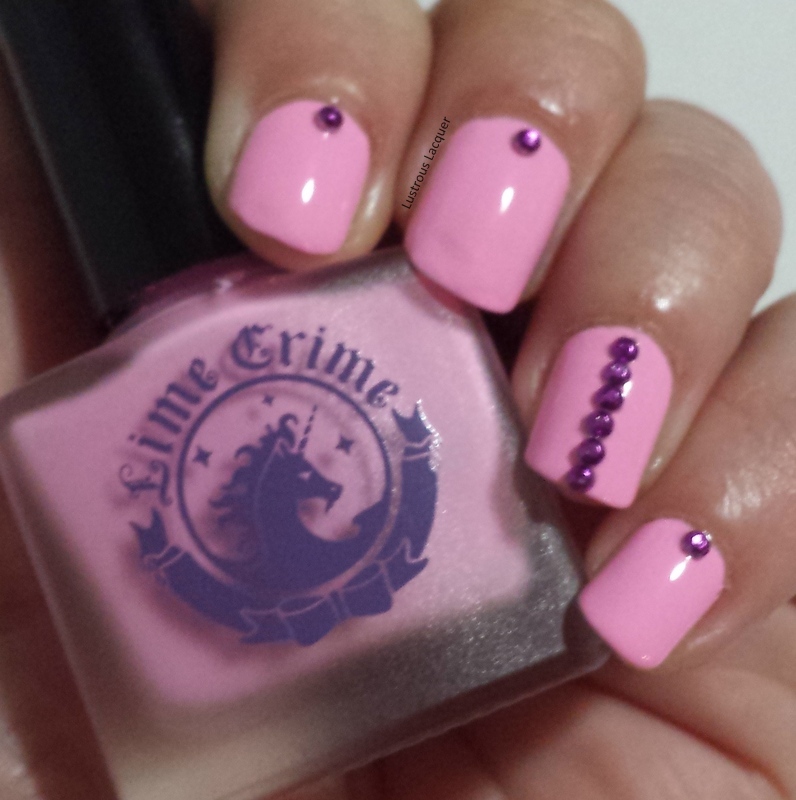 This time around I kept it simple with some purple rhinestones from Dollar Nail Art. 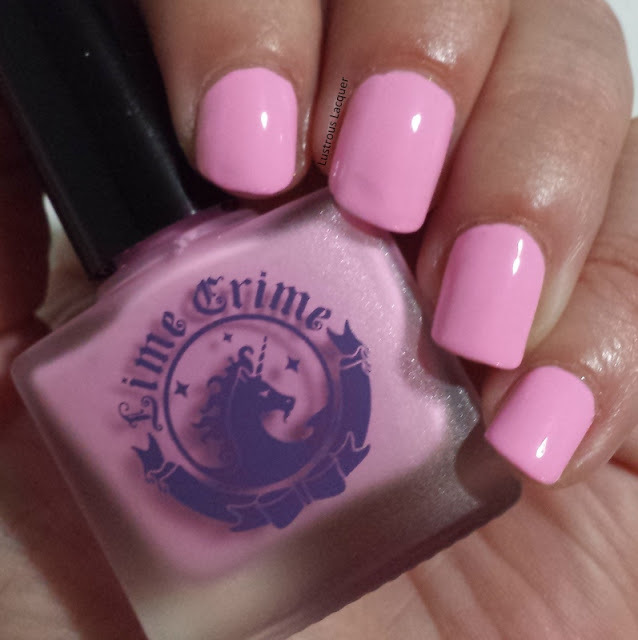 What is your favorite way to dress up a pretty creme polish? Let me know in the comments. That's all I have for you today. Back to hunting down deals on school supplies for me. Thanks for stopping by and Happy Polishing!